Major construction projects have returned to the landscape of Jacksonville's urban core. 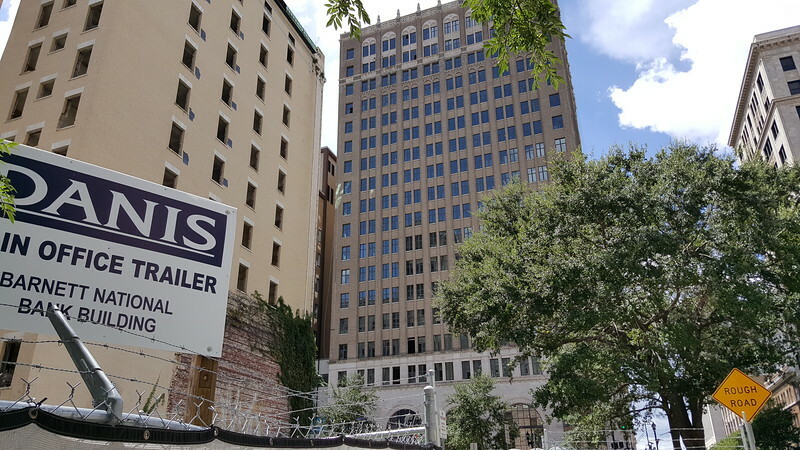 Find out where (and more) as we take a brief look at the status of various developments under construction in and around Downtown Jacksonville in September 2018. In the Springfield section, you can add the warehouse at 515 East 9th Street. It's grand opening as Springfield Station Exchange is this Saturday at 10am, an antiques & vintage furniture/decor depot. I like that the Kings Ave storage facility is set back off the road, I originally assumed it would be built right up on Kings. While the entrance will be off of Kings the structure si really being built on the old "junkyard" site off of Landon. One other add in the Springfield section - Fred Cotton's BBQ is moving from their loooong time location at 17th & Main in New Springfield to near 4th & Main, in the Springfield Historic District. Renovation work has been on-going for a couple months, they plan to open October 1st. For those familiar with the area, they're moving into the old Tapas Old World space. They'll also be changing up their menu a little - oysters & full bar. An add for the Riverside section: Be Still Float Studio, corner of Riverside & Lomax. New storefront windows, exterior lighting and signage have gone up in the past week at 12 W 8th Street around the corner from Hyperion. Based on the sign, it looks like Ycintricity, the women's clothing store on Edgewood, will be moving to SPR. Nice! Thanks for the update! It's already moved & now open.